Welcome to Trappers, a secluded wilderness location just minutes away from downtown Pigeon Forge Tennessee. Trappers offer a one-bedroom log cabin that can accommodate up to four adults comfortably. Amenities include large outdoor hot tub, outdoor deck to enjoy nature views, and access to the resort community pool. 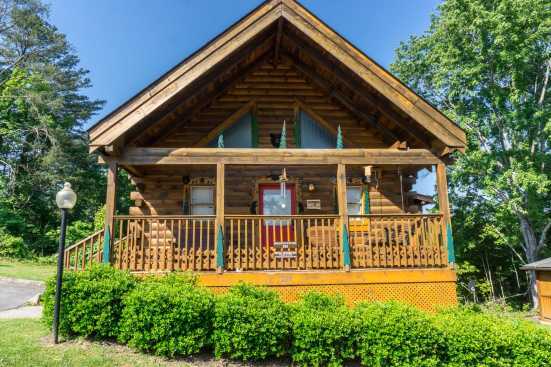 Trappers secluded location offers unbridled views of nature while also only being a short drive from all the action and attractions in downtown Pigeon Forge. Imagine walking right out your cabin door and being surrounded by the natural beauty of the wilderness. Take a day when you first arrive and explore the resort area. The area has multiple hiking trails and even some slowly cascading streams with waterfalls. After spending a day or two taking in nature, head down the road to downtown Pigeon Forge. Downtown Pigeon Forge has everything a vacation town needs. From a large variety or boutique and themed retail locations to go-carts and wineries, Pigeon Forge has something for everyone. Check out Dollywood, which is a large theme park just outside Pigeon Forge offering live performances and over forty thrilling rides. SmokyMountainsByOwners.com is the only place to plan and book your Eastern Tennessee vacation. Whether you choose to hike through the woods, explore downtown Pigeon Forge, or take in a day of live performances and high-speed roller coasters at Dollywood, fun is sure to be had by the entire family.